Coming to Clifton Campville on Thursday 10th September from 5pm to 6.30pm. The ultimate Adventure club for children aged between 5-14 years old! Inspired by survival specialists such as Bear Grylls, children will learn through our structured program skills such as shelter building, fire lighting, foraging, purification, bow making, bushcraft, tracking, orienteering, wilderness first aid, and many more adventurous skills such as raft building, kayaking, climbing, abseiling, caving and many many more… PLACES ARE LIMITED – BOOKING IS ESSENTIAL…. 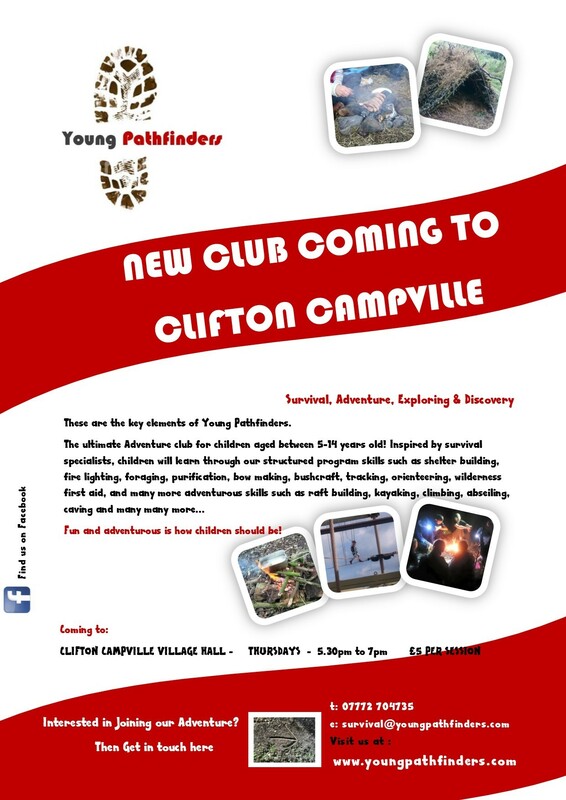 email: survival@youngpathfinders.com or call 07772 704735 for a registration form.